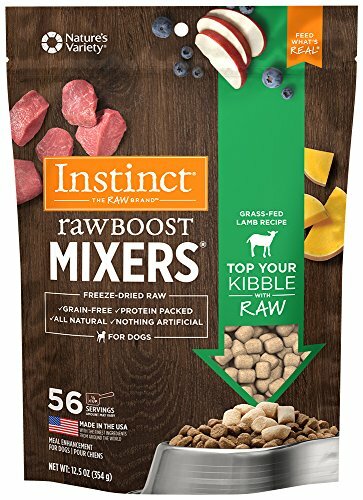 FREEZE DRIED RAW DOG FOOD TOPPER WITH GRASS FED LAMB: Add raw to your dog bowl with Instinct Raw Boost Mixers all natural, grain free dog food toppers. Made with responsibly sourced grass fed lamb, lamb organs and non-GMO vegetables and fruits. GRAIN FREE DOG FOOD MIXER: Raw, whole food ingredients are freeze dried to gently remove moisture, locking in nutrients and intesifying flavor. Made without grain, potato, corn, wheat, soy, by product meal, artificial colors or preservatives. DRY DOG FOOD TOPPER OR DOG TREAT: Add variety and excitement to dry dog food with Raw Boost Mixers. Made with all natural ingredients to support healthy digestion and skin & coat. The perfect natural dog food topper or dog treats for picky dogs & puppies. Merrick Backcountry Freeze-Dried Raw Real Chicken Recipe Meal or Mixer Grain Free Adult Dog Food, 12.5 oz.